abelisaurid theropod dinosaur from the Middle Jurassic, South America. "mefi" is a really strange second name for a dinosaur! 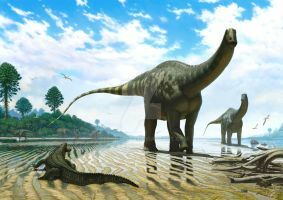 I like the names ostrommaysorum (Utahraptor), huinculensis (Argentinosaurus), osmolskae (Citipati), tolentinoi (Unaysaurus), carinatus (Massospondylus) and crenatissimus (Majungasaurus) the most. 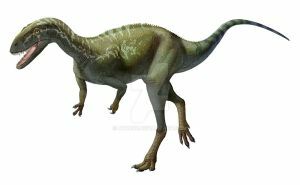 But I like Eoabelisaurus, it's fascinating how much earlier it lived before the next oldest abelisaurs! Mefi is in honor of Museo Egidio Feruglio (MEF) Museum of Paleontology Egidio Feruglio, Argentina. Scientists from that museum found the remains. Amazing!! Realistic and beautiful, it's perfect!! when was this discoverd ? I don't know when it was discovered. It was published this month. ok i look for info on it, 2009 was it discoverd. The texture and colours make it very realistic. 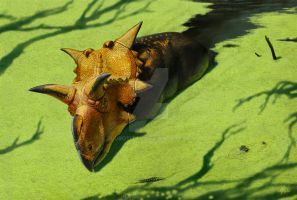 Great work for the first abelisaurid! Long arms for an abelisaurid (that's not saying much, I know). didnt austrocheirus have even longer arms though ? No, not necessarily, we know that it's manus was not atrophied like in abelisaurids, but as no remains from the arm are known, it's not possible to tell exactly how long it was. 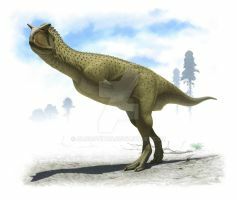 Also, Austrocheirus is an abelisauroid not an abelisaurid proper like Eoabelisaurus. I love that you're illustrating the lesser known theropods. You're such an inspiration! Gorgeous animal, gorgeous depiction of it! Jeez, I dunno how you do this stuff, it blows me away. My only wish is that the image was larger so I could see the detail! Another awesome masterpiece from you! Ну я примерно так и предполагал. Просто пока думаю на какой субстрат его поставить и может какую ботву рядом. обалденный абелиозаврид. мне ещё освещение очень нравится- живое. Oh wow, it looks photo-real!